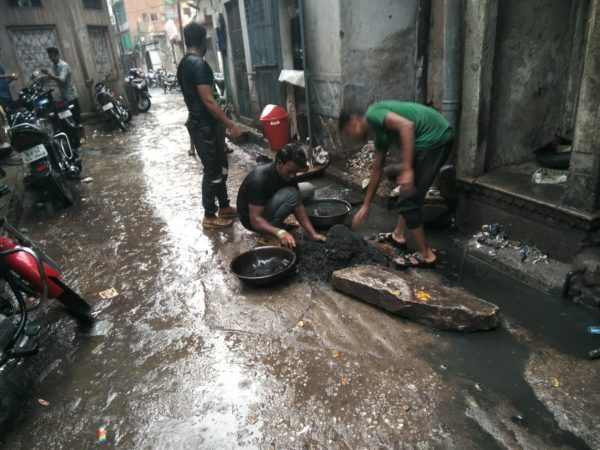 Around 50 men sieve and work daily around 8-10 hours to sieve gold dust about milligrams in the walled city part of Jaipur from the gutters in the Walled city of Jaipur. That works out to about earning Rs.150 to 200 or just 3 US $. The story takes shape like this- the water that drains out from densely crowded houses where artisans of goldsmith work and live. The frequently wash hands, bath and clean their Clothes with the water. The water drains to the street gutter. And the dust and tiny gold particles get carried to the street gutter without any control. This water is not from the toilets that have separate closed circuit sewer. The unsoiled wash water is a blessing in disguise for the hardworking workers. ornaments factories like the Sitapura Industrial Area the Factory owners float a tender and fetch up to 2 lakhs from the bidders to collect dust on a yearly basis every year. See the photo of workers with their gear having a rounded flat bucket, sieve, and brush with small cups to drain the dust.